Chew sticks have been used for centuries all over Africa as a means to clean teeth. Chew sticks are natural toothbrushes made from frayed sticks. 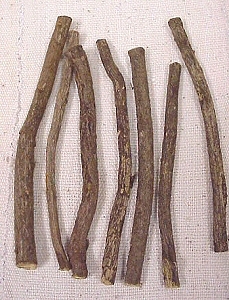 Sticks and twigs are cut from various trees and bushes such as licorice bush, gum tree, and the Salvadora Persica tree which locals call "The Toothbrush Tree". In fact, the World Health Organization promotes the use of the trigs of the Salvadora Persica tree as a natural toothbrush. Chew Sticks Available at AfricaImports.comThrough Africa, you may come across people casually chewing on a stick much like some people may have a toothpick in their mouth. The twigs are generally cut to a thickness of a pencil. Chew sticks are chewed until the end of the stick frays. The frayed end works like dental floss cleaning inbetween teeth keeping teeth and gums healthy. Once the end of a chew stick is frayed it can be rubbed on teeth, much like using a toothbrush, scrubbing food and plaque off teeth. Chew sticks are much less expensive than traditional western toothbrushes making them much more accessible to the average African. In Senegal, they are known as "sothiou" meaning "to clean" in Wolof and in Eastern African as "mswaki" meaing "toothbrush" in Swahili. Research suggests chew sticks contain a number of medically beneficial properties including abrasives, antiseptics, astringent, detergents, enzyme inhibitors, and fluoride. There are local claims chew sticks whiten teeth, freshen breath and even are good for head and stomach problems. Several studies have shown chew sticks are just as effective as tootbrushes and toothpaste for cleaning teeth and gums. Another more modern use for chew sticks is smoking cessation. Using a chew stick may reduce the need for a cigarette and may also slow the potential for weight gain while one is trying to stop smoking. Chew sticks are readily available in many flavors as well as unflavored at AfricaImports.com.